- Directed by Erik Nelson. 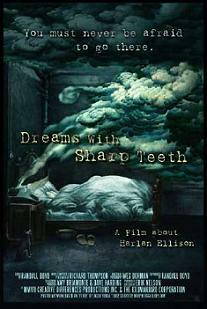 This lively, fascinating and insightful documentary focuses on Harlan Ellison, a gifted science fiction writer who was at the peek of his writing career back in the 1960s and 70s. To this very day, he remains a charismatic and above all, an honest individual. Director Erik Nelson does a terrific job of shining an honest light on Harlan and allowing him to be his angry, stubborn yet very bright self during the many interviews. Harlan also comes across as a very unique, energetic person who has keenly observed the world round him and it shows. Granted, not everyone gets along with him and some might even consider him crazy with all his ranting about the society we live in and complaining about moments from his past, but at least he has a true passion in his voice and manages to be articulate. It’s quite inspiring to hear some of his background regarding how he came to Hollywood very poor and kept on struggling to survive on a penny per word for his writings. Interviews with his friends, namely Robin Williams and Stu Levin along with critic Carol Cooper of “The Village Voice”, provide more fascinating perspectives about such an amazing, complex, artistic genius. Dreams with Sharp Teeth will make you realize that the world certainly needs more visionary, fearless, honest and intelligent people like Harlan Ellison who aren’t afraid to say what they mean and mean what they say. Number of times I checked my watch: 0. Released by Creative Differences. Opens at the Film Forum. - Directed by Nina Davenport. This compelling documentary follows the experiences of Muthana Mohmed, a student from Iraq who dreams of becoming a filmmaker. After MTV briefly films him talking about how the war had destroyed a film school in Baghdad and ruined his chances at following his dream, Liev Schreiber decides to fly him over to Prague to work as an intern on the set of his directorial debut, Everything is Illuminated. Once he arrives, he complains about his status as a gofer and that he would rather do something more productive to filmmaking rather than fetching vegan meals for Liev Schreiber. His visa expires very soon, but he can’t come back to Baghdad for fear of getting killed by those who prohibit him from working with American filmmakers. He now has to figure out how to convince the government to let him stay in Prague. Luckily, he gets a chance to work on the set of Doom and asks Dwayne “The Rock” Johnson to help pay for film school. Director Nina Davenport captures Muthana Mohmed during all his ups and downs--sometimes he comes across as stupid, lazy, stubborn and even a liar while other times he’s alert, bright, friendly and open. It would have been interesting had there been more information about what his life was like back at home in Iraq, especially his childhood. Nonetheless, Operation Filmmaker manages to be engaging and somewhat moving to watch, but not as powerful or revealing as it could have been with more insightful interviews. Number of times I checked my watch: 1. Released by First Run/Icarus Opens at the IFC Center.